Its here again! 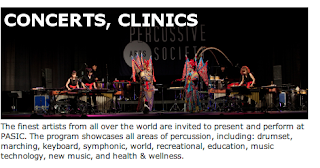 "The Percussive Arts Society International Convention (PASIC) is the largest percussion event in the world featuring over 120 concerts, clinics, master classes, labs, workshops, panels and presentations." Too many drummers in one place! Not a bad thing. Theres many interesting world music clinics in store from our NYC drummers/percussionists. Music from around the globe is being represented. See you there!